The Randy Cognac Full Quill is a 13-inch tall men's exotic boot featuring a golden chestnut leather upper with tonal stitching that compliments this boot's unique hue. The full quill ostrich foot is distressed and textured for a vintage feel and the single stitch welt offers durability. The narrow round toe and standard heel allow for a relaxed fit and cushioned insole provides support for lasting comfort throughout the day. This style is proudly Made in the USA with global parts. Hi Tommy. Thanks for letting us know. We`re so sorry to hear that you`ve had an unpleasant experience with us. Please give us a call at 1-800-548-1021 and we`ll work with you to find a solution. 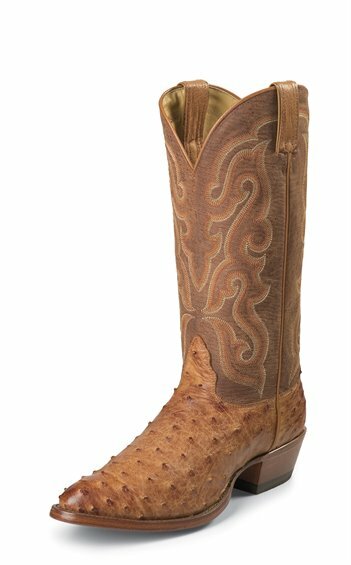 I have been wearing NOCONA for 30+ years, I once owned over 35 pairs. Until just over 5 years ago had to stop wearing boots to liver failure because my legs & feet swell. Now that I had a transplant I would like to give it another try. I'm unsure of a proper fit? Nocona has always taken care of me and I hope they still will. I bought mine about 30 years ago at the factory in Nocona,Texas. Great Boots,I have several pair I bought at the factory! I was a driver for Kimberly-Clark Corp.